Most cities are famous due to their history, culture, architecture, or cuisine. Yet Portland finds pride in having a bit of everything. That’s the only thing you can be sure of. It’s notorious for its gardens, its food trucks and its bearded, man-bunned, flannel-wearing hipsters. At first glimpse Portland seems like an ordinary city, with a large blue vein running across the middle, dividing it into the hip West and industrial East. Yet it will only take a second for your brain to register that, yes, it is not normal to have a whole block occupied by food trucks. Your nose overwhelmed by the smells of Greek gyros, Lebanese falafel, Scottish fish n’ chips, Mexican burritos, banging pots, steaming pans, and simmering soy sprouts. But don’t you worry, food trucks are found at every corner. With 600 tiny kitchens and counting, Portland’s food-cart scene is legendary. Now, dessert is a whole other story: Although they are not the best doughnuts you’ll find in Portland (that’s Blue Star), Voodoo Doughnut is the place that started the doughnut trend and its bright pink history gives Portland its own kind of weirdness. They are known for their crazy shapes and flavors, like their popular bacon maple and even a doughnut in the shape of a voodoo doll. Be aware that their doughnuts may not be appropriate for all ages…let’s just say they serve a mature clientele. Most of the time there is a line around the block, so remember to have some dollars on you (cash only!) before you wait in line for half an hour. And if doughnuts are not your thing, head to Portland’s most peculiar ice cream shop Salt & Straw to try their deliciously peculiar flavors: avocado and strawberry sherbet, black olive brittle and goat cheese, and olive oil and lemon custard. The flavors are exactly what they sound like, and trust me when I say it’s worth the wait. Next, head down south to everyone’s favorite bookstore, Powell’s City of Books. Well, it’s almost a city: their book inventory exceeds two million volumes, covers a whole block and three floors. It is color coded by genre; a control freak’s dream bookstore. Shop new, used, rare, and out-of-print books; browse the computers that contain every edition in the bookstore; and bring supplies to last you a week. When exiting stop by the hipster with the typewriter (of-course it’s a typewriter) to pick up some custom, spur-of-the-moment poetry. Cross West Burnside Street and find yourself drowning in satin, leather, and denim. Don’t forget to buy those neon turquoise unworn Converse that you found in a pile of shoes for ten dollars. Even if they are a size too big. Follow the street signs to find yourself in the Pearl District. Loading docks and cobblestone streets hint at this former warehouse district’s past, while stylish bars and gleaming lofts point toward the future. A true testament to Portland’s uncommon brand of originality. Sneak into tiny boutique stores on the 23rd Avenue selling handmade woolen sweaters, a vegan stoner cookbook (in case you haven’t googled it yet, recreational marijuana is legal-as if you needed another reason to visit), recycled flip-flop bangles, engraved ice cream spoons for $25 and hand-drawn maps of Portland. Stroll amongst the bamboo trees in Lan Su Chinese Garden, hypnotized by the rippling water, the meandering Koi fish and the plucking sounds of the guzheng (Chinese plucked string instrument). Even if you try to convince yourself you are in a bustling megacity, this garden conceals the towering Bancorp Tower and the buzzing car traffic that had previously caused you to sit in your car for three hours and curse everything around you. Wander in Portland’s Chinatown, until you come to the dingiest and grimiest Chinese restaurant. Fight your subconscious and fill your stomach with the most delicious Chinese food you will ever find (force yourself to ask for fortune cookies, no matter how childish you feel like while doing it. Keep the message). Scramble on the bus and start the towering ascent to Pittock Mansion. If you are lucky enough and there are no clouds you can see Mount Hood across the sprawling city. Sneak into the suffocating bathrooms and stare at the portraits of so many generations. One of them winks. Trek the path to the Japanese Gardens. Sit beneath the blooming cherry tree and sketch the gravel patterns. When the evening sun sets, it casts long shadows on this subtle yet intriguing pattern, like a sundial. Try not to stain your new vintage jeans with watercolors, although no one would find that noteworthy in Portland, Capital Hipster. Cross the street to the International Rose Test Garden, bump against the pungent smell of roses. Walk among 7,000 luscious rose bushes. Portland has long been an incubator for the scented beauties, hence its nickname City of Roses. Finally, come to a stop at the Oregon Zoo. Spread your blanket on the grass, listen to jazz every Tuesday and have dinner from yet another food truck. You can never have enough. Dance under the twinkling lights, and then call it a night. Go to bed thinking about how all your explorations were really worth it. Take your fortune cookie and your custom poetry and keep them in your wallet, to remind you that everything leads to something far better, even Portland traffic. From warehouses turned breweries to Lebanese food trucks blasting Greek music painted in red stripes and white stars, Portland has something for everyone. Sure, it’s weird. But would you rather have boring? 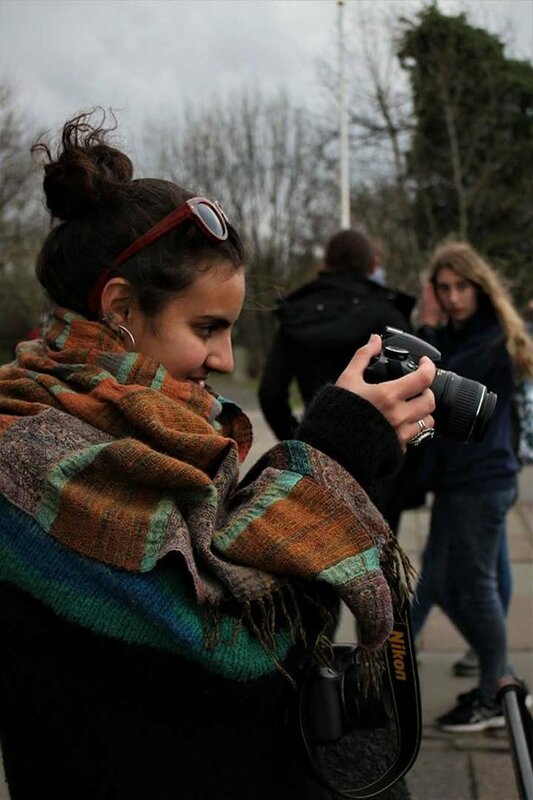 Meli Vasiloudes Bayada is an eighteen-year-old traveler from Cyprus who will be studying Sociology beginning next year. Coming from a small island in the Mediterranean she felt isolated both culturally and geographically from the rest of the world, igniting her desire to travel, getting the chance to explore everywhere from Arctic villages in Norway to tropical communities in Sri Lanka.